What I find confusing, is the fact that we are trying to go back to making products and food with nothing but natural ingredients. It confuses me that there are so many artificial products out there that we have to spend so much time seeking out green/eco-friendly products. Mattresses have been one of the many products that are made of artificial materials that have been horrible for the environment for years. Finally, as of the last few years, mattress manufacturers have invested in creating green mattresses that won’t cause so much harm to our precious world. Why Get a Green Mattress? We are in a world where people are getting sick constantly from all of the unnatural chemicals and materials used in manufacturing everything. Some common disorders that traditional mattresses have on people is eczema and allergies. These two problems could become serious for some people and they unfortunately have no idea that their mattress is the leading cause of their problems. Mattresses aren’t exactly the smallest thing you own. Roughly 8,000 mattresses make it to a landfill every day. 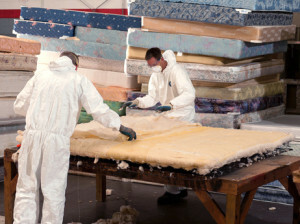 Most mattresses are made of foam, steel and fibers. These materials either don’t break down at all or take a terribly long time to decompose. About 175 million pounds of these materials make their way into landfills every year causing unwarranted problems to our environment. The best eco-friendly mattresses are natural latex mattresses. They come in all of the same sizes as any other mattress (California King, King, Queen, Twin and Full). You can even get organic crib mattresses from some companies which could be great for starting a child off with the best sleeping arrangements. Not all organic latex mattresses are the same. Read our latex mattress buying guide to find out more about how these beds are made. When shopping for a green latex mattress, be sure to make sure that not just the mattress’ latex core is made of green/organic material. Also check to make sure that the other materials are made of natural materials. This includes the upholstery (bamboo is great) and the foundation that the mattress rests upon.